First time my kids saw one of these they thought it was a penguin. My first year of serious birding yielded this great find. I didn't know they even came through the Valley. I was smitten and he was annoyed but tolerated us pretty well. Behavior: He was so tired he couldn't fly away. He just kept looking down at me as if to say. "you're still here?" We left him perched facing the afternoon sun. What an amazing experience. 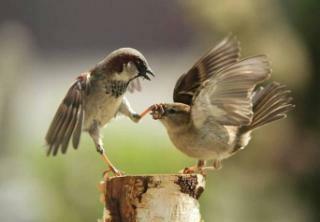 I love Sparrows but even I get tired of hearing them sometimes. Evidently so did this male! Thank you Bill Bull for sharing this picture that someone shared with you! On our way to go birding at Laguna Atascosa my sister Sara noticed this Aplomado Falcon off at a distance. Not the best shot but still thrilled us to watch him. We saw him near this same spot almost a year ago. Another great job of spotting Sis! Location: Farm Road outside of Rio Hondo, Texas. Behavior: He was sitting near a Cara Cara and Vultures waiting a turn to eat something dead in the recently plowed field. These frogs were all knotted together sitting on the side of a small water tank. Below the water tank we saw the Indigo snake getting closer and closer. His tail started to twitch just like a Rattlesnake. Obviously there was something behind the tank we couldn't see. Suddenly a frog jumped 5 ft into the air and so did the snake catching it mid-air. When it landed the frog got away but then jumped a second time and was caught mid-air a second time. The snake carried it off to the brush area but still within our view. He seemed to enjoy his lunch and we enjoyed to photographing the wild nature moment. Oh, I forgot to mention there was an alligator sitting in the water tank the whole time. 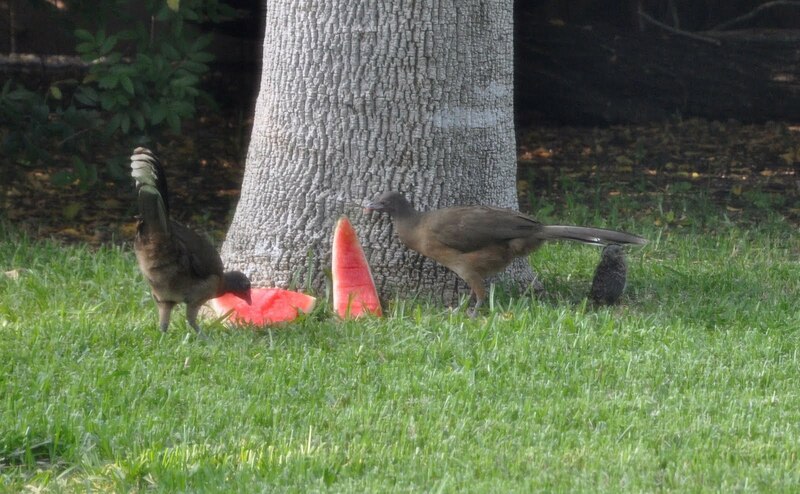 Please click on the picture to enlarge it so you see the small Chachalaca chick on the right. I love to feed them watermelon but I have decided they will eat anything! I looked out and wondered what a quail was doing in my yard then I saw it again with this pair of Chachalacas. What a treat. Eventually we saw 2 chicks. Behavior: Very guarded the second time I spotted them. The stay close by the chicks. I included this because I love the shot! Very busy with reflection of the trees but that is why I love it. Behavior: Sitting on the edge contemplating a bath. Coopers Hawk in my backyard! This hawk likes to hang out in my backyard and misbehave. He can sure empty a yard when he shows up. A couple of days ago I saw him sweep down and hit a squirrel. The squirrel not only got away but chased the hawk off. Yay squrriel! Behavior: Sits on back fence watching over the yard. Sometimes sit on telephone pole in alley and makes calls for up to an hour at a time. 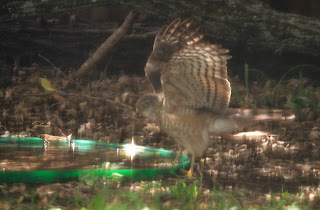 Has been seen bathing and drinking from the watering station in the back of our yard. The Great Egret is so graceful moving through the water. I love that I caught the reflection in the water. I have many opportunities to photograph this bird around the Valley. It is a common water bird here in South Texs. Behavior: Egret was gliding through the water then darting its beak into the water to retrieve small fish or frogs. While birding at the fabulous Inn at Chachalaca Bend we came upon this snake resting in branches that hung over the water. I knew it wasn't a Rattlesnake so I felt pretty safe standing there taking pictures. I looked him up and discovered it is not venomous but is one of the most aggressive snakes in Texas! Yikes! click to enlarge to better see the snakes' large lump/dinner on this picture. Behavior: The snake had just eaten something really large and was very still -using all its energy to digest it instead of biting me!!! While birding with my 2 sisters in Weslaco we came across this young Vermillion Flycatcher. I believe he is young because of the white patches. Normally they are all red and black. Very nice addition to my life list. Thank you Alice for noticing him while other sis, Sara and I were looking in the oposite direction! Shown here are my sisters, Sara Lacy on the left and Alice Myers on the right. Great gals to bird with. Behavior: Very very windy day and we noticed him hanging for dear life on a small tree near the resaca. I have also spotted him at Choke Canyon State Park and in Harlingen, Texas at McKelvey Park. Greenjay - Only in South Texas! This bird is a favorite of mine. Noisy, bossy, and beautiful! 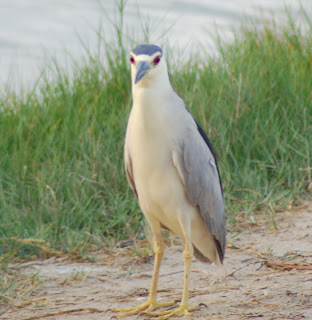 I love to take lunch to Laguna Atascosa National Wildlife Refuge and share tidbits with these very entertaining birds. I have had 3 occasions where I caught seen Greenjays in my backyard at my feeders. I may never move! Pine Warbler - In South Texas? I was surprised to discover this was a Pine Warbler. I had it identified by one of the birding tour guilds from Santa Ana Wildlife Refuge. How could I argue with him!?! They don't even show up as migrating through South Texas in my birding book. I saw these everywhere in the Valley during February. Location: Ranch in Star County but photographed in Harlingen as well. 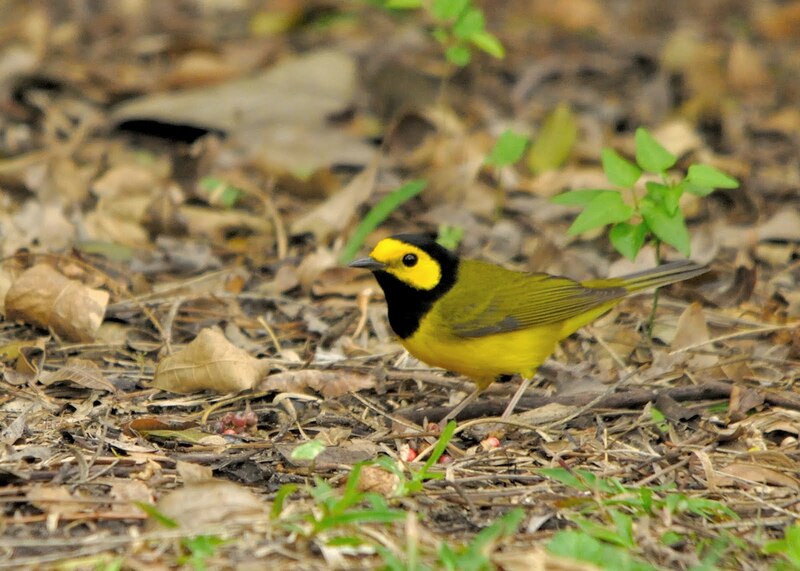 Behavior: Not near as feisty as other Warblers. He seemed much more laid back giving me plenty of time to take pictures. Friends from Laguna Atascosa National Wildlife Refuge sent me this picture of a Cougar. Cougars are one of 5 wild cats here in South Texas. This picture was taken at night from a motion-sensor camera. I have such a camera and plan to set it up in my yard facing the birding station. I know we have had raccoons, armadillos and possumns. Who knows I may have a cat toobut not as big as this Cougar! Behavior: Appears to be looking for food at night which would be typical. Also note: An adult Cougar is between three and four feet long with a tail of two and half to three feet. Its height at the shoulder is between 25-30 inches and it can weigh anywhere from 70-170 pounds. These cats are solitary, except during breeding. Young, usually two to three cubs, can be born almost any time of the year. 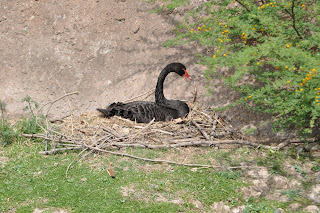 Females usually breed every two to three years. I left a small tub of water outside and when I went to throw it away a couple of weeks later I found it was occupied. Yellow-rumped Warbler aka Butter Butts - I didn't make this up! 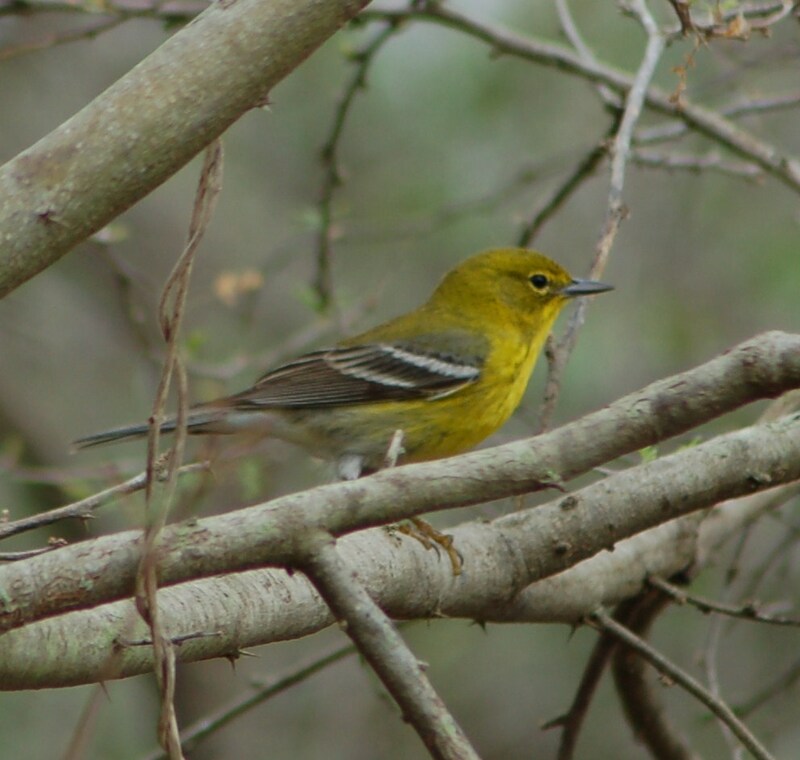 We see this little warbler all over South Texas in late winter. I usually see and hear groups of yellow-rumped warblers but this one was all alone. Behavior: He was going from tree to tree skirting the lake and calling the whole time. 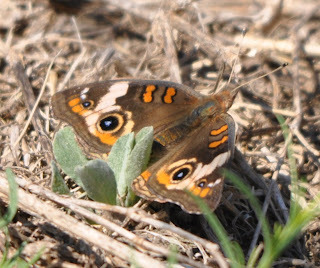 Behavior: It was during the heat of the day so this butterfly was moving very fast through the meadow. I was told the best time to photograph butterflies is in the morning. We first saw these beautiful birds in my front yard in 2009. Female was taking a bath in the overwatered flowerbed while the male sat in the tree. He made a sound that could be heard for blocks away that sounds just like a distant swing squealing under the weight of a child. That is how we know what to listen for while birding. Here is a male. He stays high in the trees unless he finds a sunflower seedhead worthy of hanging around for lunch. This female made herself at home on my new "old" screen window birdfeeder. She stayed eating for 3 days but I never spotted the mail dropping in for food. I bought a sock you hang with niger seed that supposedly finches are crazy about. Haven't seen either one since. 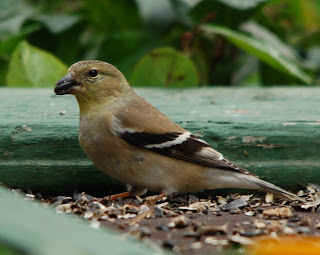 Behavior: She was very hungry which made her less intimidated by other birds at feeder but male was very shy and never came to feeder while I was watching. He was not far away though because I could hear his "swingset" call. With so few canopy trees at the South Padre Island Golf Club this poor owl had to nest in a palm tree. The owl built a nest and laid eggs. It was very interesting to watch. A late cool front blew through and the eggs and nest fell out. We were so dissappointed. Didn't come back the next year. Behavior: Stood in tall palm trees next to parking lot for several days scoping out the territory. Finally built its nest in shorter palm tree further from the building. Wasn't happy with all the attention once it had eggs in its nest. I promise to not post any other non-native or non-migratory birds on my site. I only post this because of the fabulous nest. Those aren't twigs along the edge but branches. I would have given anything to have photographed the nest being built. Behavior: Sat on the amazingly large nest while 100's of people passed by. Used its zoo manners. This champange colored bird caused a riff between my husband and I. I looked out the backporch and saw my fence lined with cedar waxwings. I tried to get husband to come look but he was preoccupied. When he finally went to look they were gone. He kept telling me what I had seen was probably just doves. Since then I have seen them every winter for 5 years. Sweet husband has yet to see them. 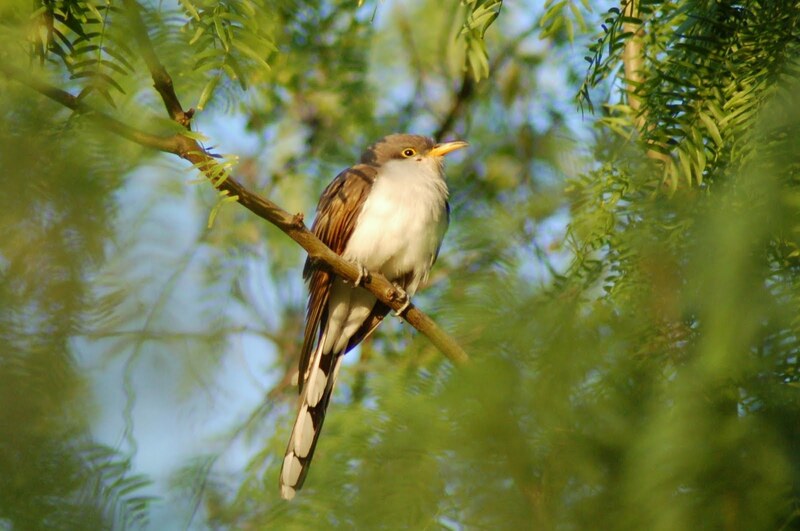 This incredible bird has wandered into South Texas from Mexcio and my birding buddy/sister and I drove to McAllen to try to see him. My sister, Sara Lacy, literally walked right to the spot where he was eating. 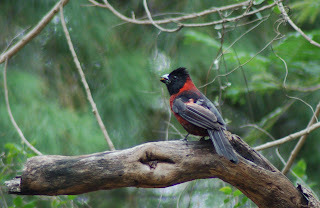 Everyone in the Valley was on the lookout for this treasure and we saw him within 5 minute of arriving at the gorgeous Quinta Matzalan Birding reserve. Behavior: Didn't mind being watched until small noisy crowd showed up then he darted in and out of a fruit tree till we could no longer find him. Darn birders! Here is my sister, Sara Lacy, offering food to a fellow "Cardinal" (Our High School Mascot). Sis is one of the best birders I've ever gone with. She can spot a bird behind every bush! Now identifying it is a little harder for both of us. I've nicknamed her BIRDOG - a name I'm sure she loves. Don't hate us because we are beautiful! Behavior: Cardinals, greenjays, and orioles have been known to eat from your hand or at least near you while having a picnic at the Refuge. Guess Whose Coming to Dinner? 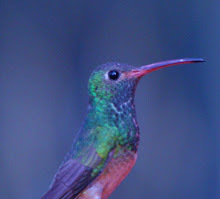 This is a Buff Bellied Hummingbird that has been in my backyard for nearly a year! You just HAFTA click on this picture to see how beautiful he is. I love Orioles. This one pretended we weren't standing nearby taking his picture. I thought He was a full-timer at Ramsy Park but now I belive I've been seeing the Hooded Oriole in the Summer. Behavior: Too busy eating to care that birders were watching. He was aggresively chowing down at the feeders located in what the park calls the Hummingbird Station. Very busy Hooded Warbler visited my backyard for 2nd day in a row. Last seen in April of last year. He is migrating through. Hard to photograph because he moves around so fast. Behavior: He was bathing in birdbath near backporch then seen foraging on ground under the thicket of pepper berry trees towards back of yard. 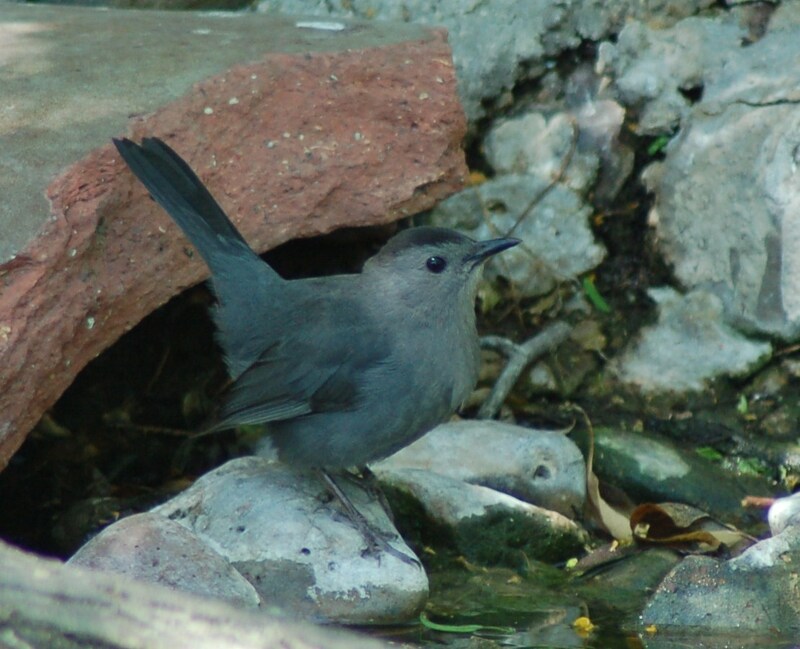 We've had a Catbird in our yard once. Very common up north but not for us South Texas Birders. from a partially hidden birdbath. We've seen several at Ramsey Park in Harlingen lately which is where I took this picture. Behavior: He was drinking and taking a bath but unable to even get near the bird food because of pesky Mockingbird. The only thing I like better than being outdoors is TALKING about being outdoors. Here I am dressed and ready to speak as the GARDEN ANGEL. I always close with a reminder to plant something that will outlive you besides a tree or flowers... sow a seed of hope for a foster child! Sharing my birding adventures is so much fun! Hope you'll come check back often! Why are there Snakes, Frogs, and Alligators on a Birding Journal Blog? When I go birding I always stumble across something else wonderful to take pictures of. Whether its flowers, butterflies, insects, or alligators it's all fun to see and share. This Belted Kingfisher was sitting about 10 yards from us. He was too busy talking (not singing) to another Kingfisher across the Arroyo Colorado River to care about us. What is a Life List? 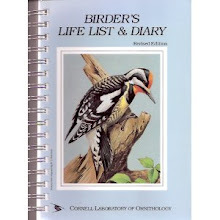 A Life List is keeping a diary or journal to list the birds you have seen. Click on the picture for Birder's Life List and Diary. You can also find sites online to post and save your list. Birding has helped me to live in the "now". You can't be thinking about your grocery list when you are peeking at a beautiful bird. Journaling helps me re-live favorite outdoor moments. I TOOK THESE PICS UNLESS NOTED IN POST! Husband, John, knows bird calls, understands all the buttons on our cameras, keeps me feeling safe no matter where we go birding. Grandaughter Logan is tons of fun to bird with. She has taken some amazing Ani pictures that I will post someday. She even won Honorable Mention at Birdfest in 2010. Janet Randall has been our instructor and birding guide for a few year now. She is so knowledgable and has a great sense of humor as well! Daughter, Joni Magee is new to birding but no stranger to animals. She really has a gift when it comes to birds and animals. Sis, Sara Lacy is riot to bird with. I swear she is a bird magnet. 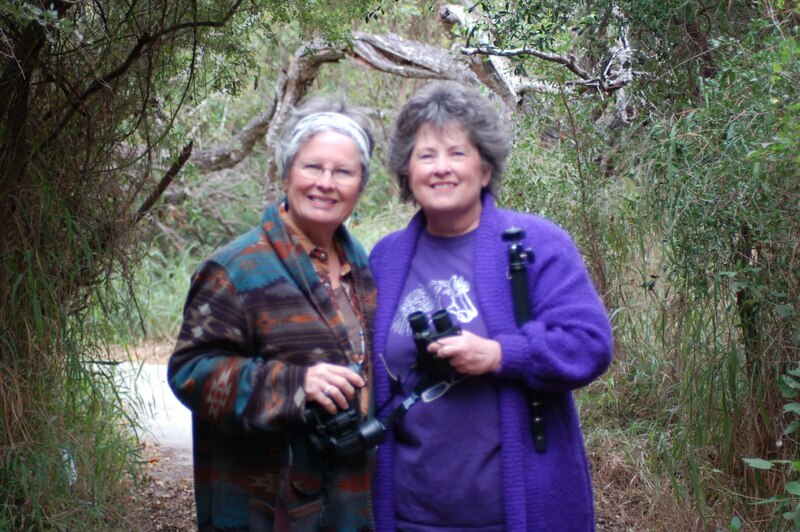 Birding with Cousin, Melody Lytle is always a great experience. Her knowledge of animal behavior and photography stratetgies are always educational and entertaining!